Fundraiser by Sunil Khanna : eBorg Robotics Inc.
Science, Technology, Engineering, and Math (STEM) has been a powerful engine for prosperity in the U.S. However, currently in the U.S. student performance and enthusiasm in STEM education is inadequate to support U.S. leadership in STEM professions. A technology driven economy and skilled workforce in STEM fields is the driving force for innovation. The purpose of eBorg Robotics Inc. is to encourage students to pursue education and careers in STEM related fields. The corporation will instill vision, confidence, and a sense that students can create their own future in a world where science and technology are celebrated. eBorg Robotics Inc. will support students by conducting outreaches as well as raising funds to support efforts to inspire kids to embrace STEM education and careers. After several meetings and discussions between the eBorg Robotics team and the talented team at Vertellus in Parsippany, NJ, Vertellus generously and graciously contributed $5000 to help eBorg Robotics in their efforts to spread interest in the STEM fields as well as compete in the FIRST FTC competition. Thanks Vertellus! 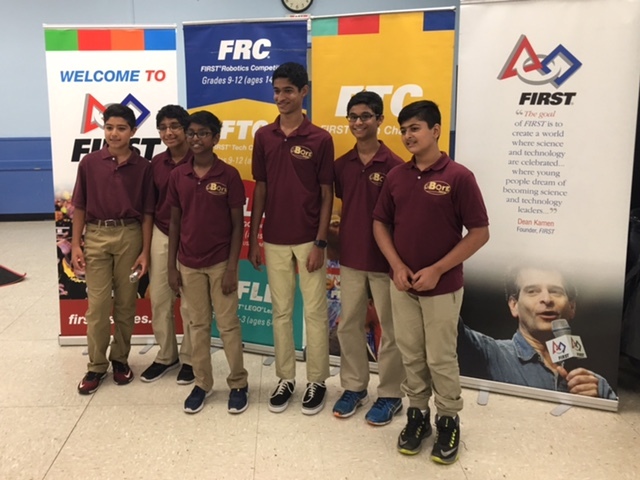 In the Summer of 2017, members of the FTC eBorg Robotics team conducted an outreach nearly 8,000 miles away in Mumbai, India. India is a country with more than one billion people, only a third of whom are able to read. Rapidly growing size of population, shortages of teachers, books, and basic facilities, and insufficient public funds to cover education costs are some of the nation’s toughest challenges. As such, the team decided that an underprivileged school in the Thane District would be the perfect place to hold an outreach. Students in this school came from families with little money many of which lived in the notorious slum areas of this 16th most populated Indian city. This school became the setting for an unbelievable opportunity to ignite the flame of curiosity within its students. Members of eBorg Robotics spent an afternoon teaching the kids about the basics of robotics using a Lego EV3 kit and software. Together, the eBorg Robotics mentors and students successfully constructed a demo robot. 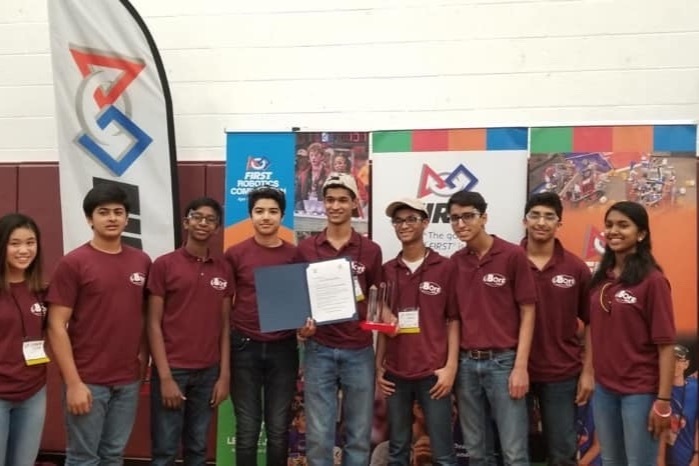 This rookie FTC team had taken a significant step forward in achieving its goal to inspire students to pursue education in an area that up until now they never knew existed. 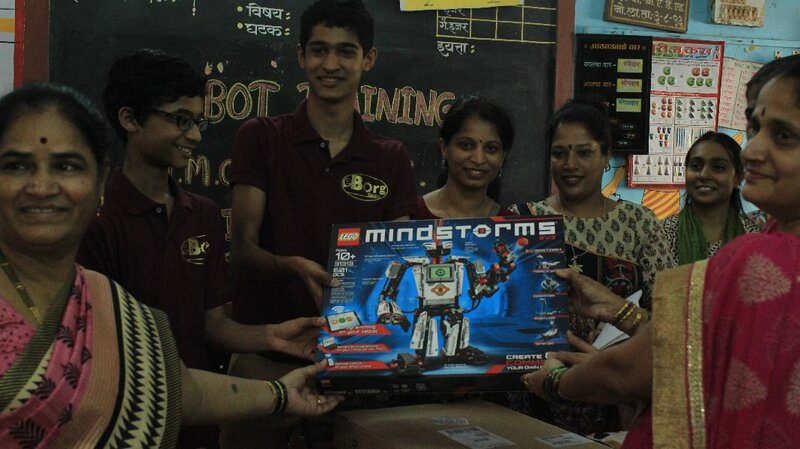 In order to commemorate the experience, eBorg Robotics donated a Lego EV3 kit to the school. Additionally, the team continued to guide the students by connecting with the teachers and their classes through online mediums such as Skype. eBorg Robotics hopes to continue to serve and support local and global communities in a similar manner. 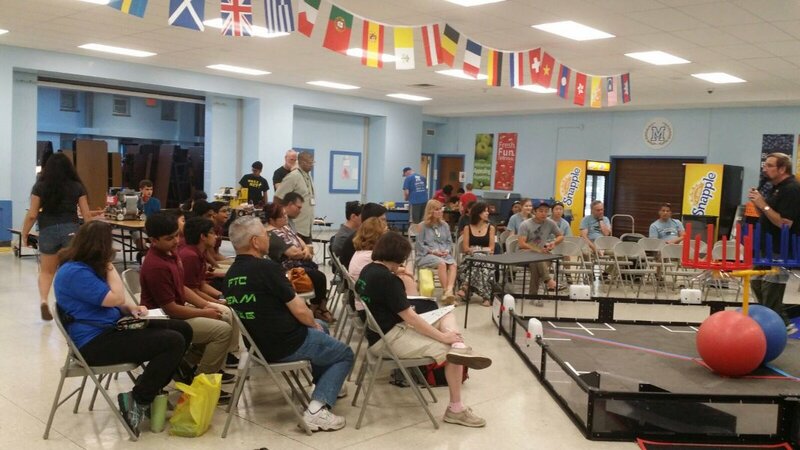 On July 9th, eBorg Robotics attended an Outreach Scrimmage hosted by Millburn High School in NJ. Several veteran robotics teams from New Jersey First Tech Challenge (NJ FTC) gathered to share their expertise with rookie teams and guests. eBorg Robotics had the awesome opportunity to form alliances with Millburn Robotics (Team #8405), CodeRunners (Team #6936), and Roselle Catholics HS (Team #9709). Our alliance with CodeRunners resulted in an overall victory for the day! The Summer Outreach Scrimmage was a great low-pressure opportunity for veteran teams to give back to the First Robotics community. Although the event lasted most of the day, it was filled with plenty of teaching, tinkering, and a taste of the real competition! Keep up the great work! Go eBorg Robotics!!! Love the passion of the team. Good Luck eBorg Robotics!